My K-I-S-S method of fall decorating came into play in a big way in this room. Do you know what K-I-S-S stands for in the world of decorating? Learn all about it right HERE. 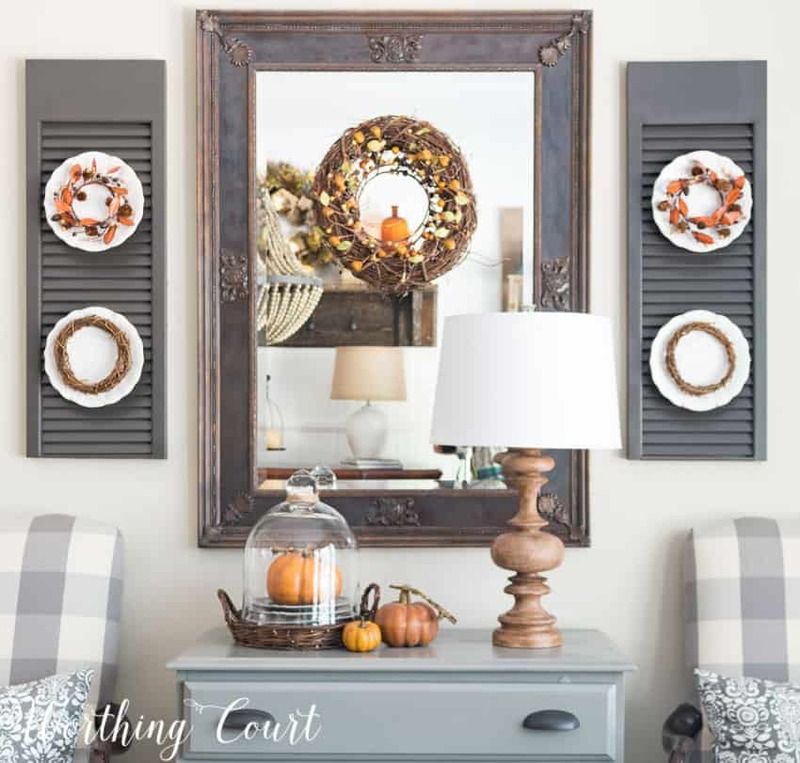 I was able to use candle rings and twig wreaths to dress up the mirror and the plates that are hanging on the shutters. I wired a candle ring to a plain twig wreath for the mirror and then used Command Strips to hold each wreath all in place. If I turn the camera at just a little bit of an angle, I get a great reflection of the other side of the room in the mirror. Love it! That’s one of the big reasons that I kept a mirror above this little chest, instead of replacing it with a chalkboard, when I gave the room its makeover. Plus it adds quite a bit of extra light to this dark’ish room. My vintage shelf, that hangs above the sideboard, used to be a fireplace mantel. Someone simply cut the side pieces off and then I added hooks to it. Sometimes I hang baskets from the hooks, but I thought would be too much for this vignette. I made sure to load it up with fall goodies though! When I made my Fixer Upper style hanging lanterns, I had a feeling that they’d be a fun place to add seasonal accents too. For fall, I dressed them up with a couple of fall colored plates and some cotton stems. You can find the tutorial for making your own hanging lanterns displays HERE. Using more of the K-I-S-S method of fall decorating, I left my dough bowl on the table and simply refilled it with all sorts of fall goodies. If you have trouble knowing what to fill a dough bowl with or how to do it, I gave step by step directions HERE. Let me pull the camera back a little to give you a better view of the room and layout. 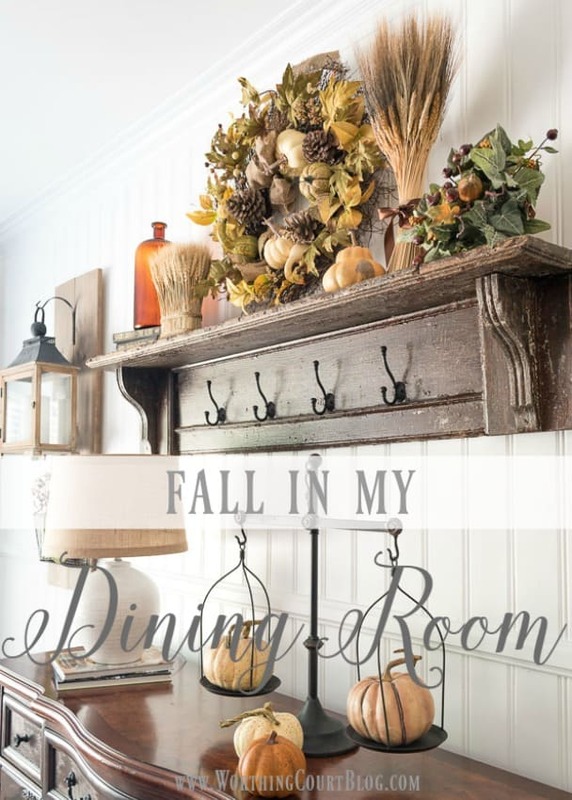 I hope you’ve enjoyed this tour of my dining room decked out for fall. 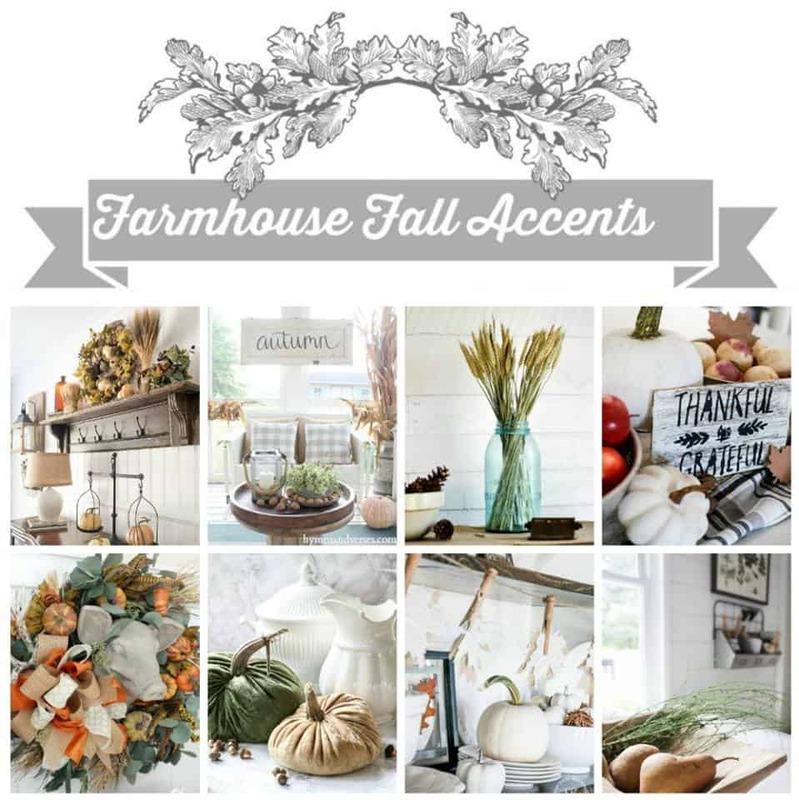 I’m honored to be sharing Farmhouse Fall Accents with you today along with these other fab ladies! You won’t want to miss what they have to share too. Simply click on the links below to be taken directly to see their projects. Where did you get that scale? I love, love, LOVE it. If you add a link, I will buy it from the link. Fall is my favorite season, and you knocked this seasonal decorating out of the ballpark. Did you do anything on the front porch? Here’s a link to the scale: https://paintedfoxhome.com/product/the-jilly-kay/ They’re a little pricey, but usually sell out quickly. This isn’t the only place that I’ve seen them, but it’s the only one I can find at the moment. Still working on the front porch! I love it all! Everything is beautiful. I bought lanterns for the display like yours. I can’t wait to finish them. 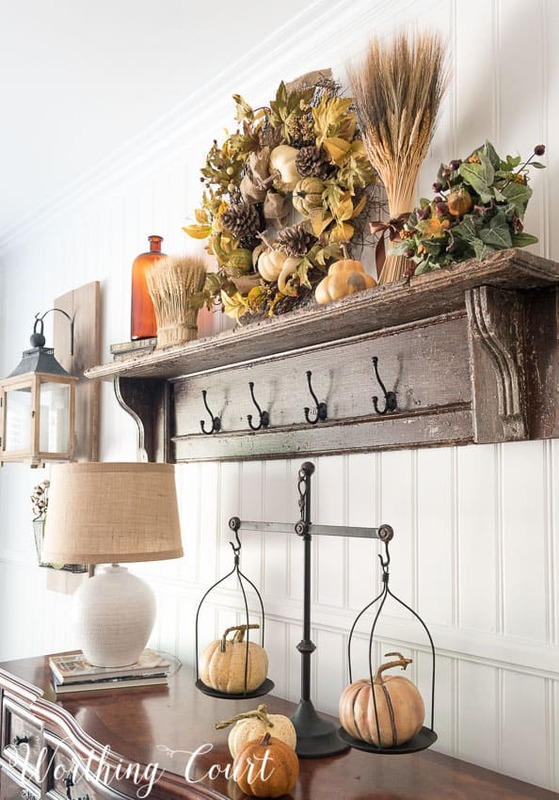 Love the old fireplace mantel and the hooks! thinking about how I can do something similar in the entrance to my home! Beautiful, beautiful! Love your dining room so much! Ohhhh….I adore that scale with the pumpkins! The plates with the little candle rings and wreaths are breathtaking-it’s all beautiful! So pretty, you are a great inspiration. Thanks for the detailed info. 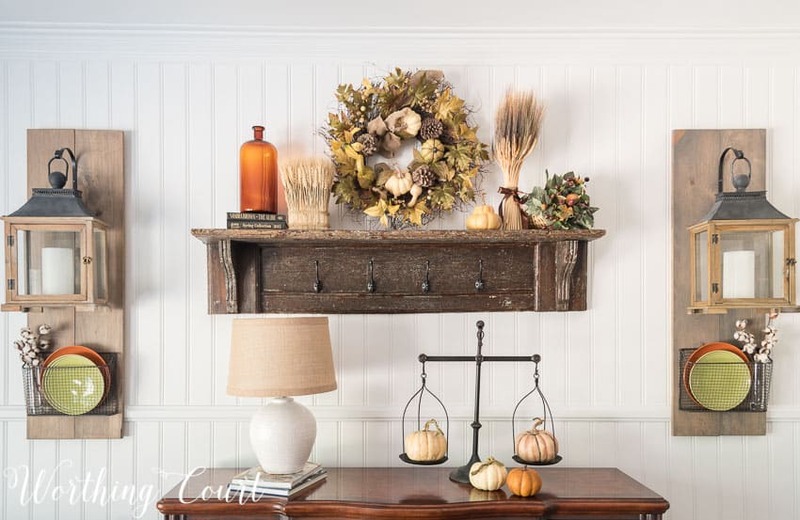 Your home looks so cozy and inviting for autumn, Suzy and that antique shelf is stunning! Just gorgeous, Suzie! I think I seriously need to adopt the KISS method!!!! I pinned your dining room last week – it’s just gorgeous!!! I think your K.I.S.S. method is genius! I too try to add seasonal decor into my existing decor. I LOVE your vintage shelf and Fixer Upper lanterns are amazing! I could move right into your home, Suzy! What party girls we are… 2 parties together this week! Talk to you on Friday! I love your vintage shelf and will be looking for one of those! I am making lanterns on barnwood left over from wedding decorations. I hope mine look as good as yours. What a bright and comfortable dining room! I love the tan colored lamp ~ so pretty! I need to get upstairs and bring fall down! Thanks for the inspiration! Suzy, I love everything about this cozy room. The fall touches are perfect as is your KISS method! So glad to be sharing along with you today! Thanks so much for sharing your farmhouse projects I have been given several cedar siding boards from a house built in 1901 and also a couple of door knobs and plates. My plan is to try to using these to make a hanging lantern project with the door knobs at the base for hangers and am looking for lanterns at present. Hope you don’t mind a copycat project. Hi Jean. That’s the whole reason behind this lil’ ole blog – I want to inspire you! Plus, I consider being a copycat the sincerest form of flattery! 😀 If you can, I’d love for you to email me a photo of your finished project. I am trying o get into the white pumpkin thing this year. I decided to ease into it use a mix of colors. Just gorgeous as always! I guess it’s about time for me to think about pulling out my tubs of decor! Wow this is such a pretty set up! I love your centerpiece! Your dining room looks fabulous! I am loving that dough bowl , and the way you decorated it for fall. Simple, yet elegant. 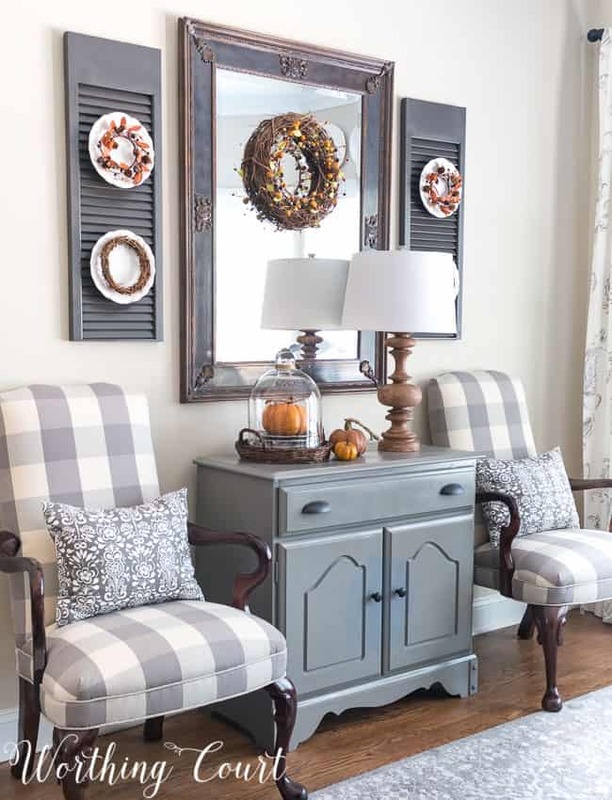 Suzy, your Fall dining room is fabulous! I love all of your beautiful Fall embellishments! Your dough bowl is awesome, and your mantel turned shelf is to die for! Look forward to seeing more! I especially like the plates that you put in the wire baskets – very cute….and the mini pumpkins on the scale are my next favorite. 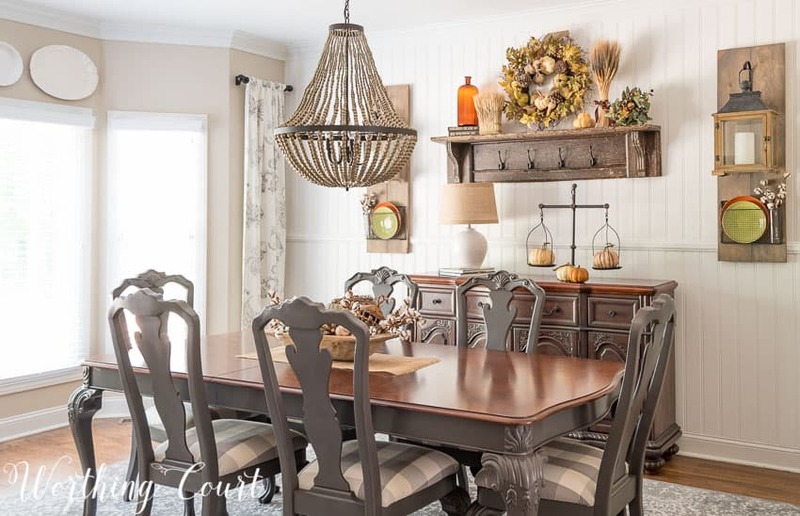 Your fall dining room looks beautiful, Suzy. 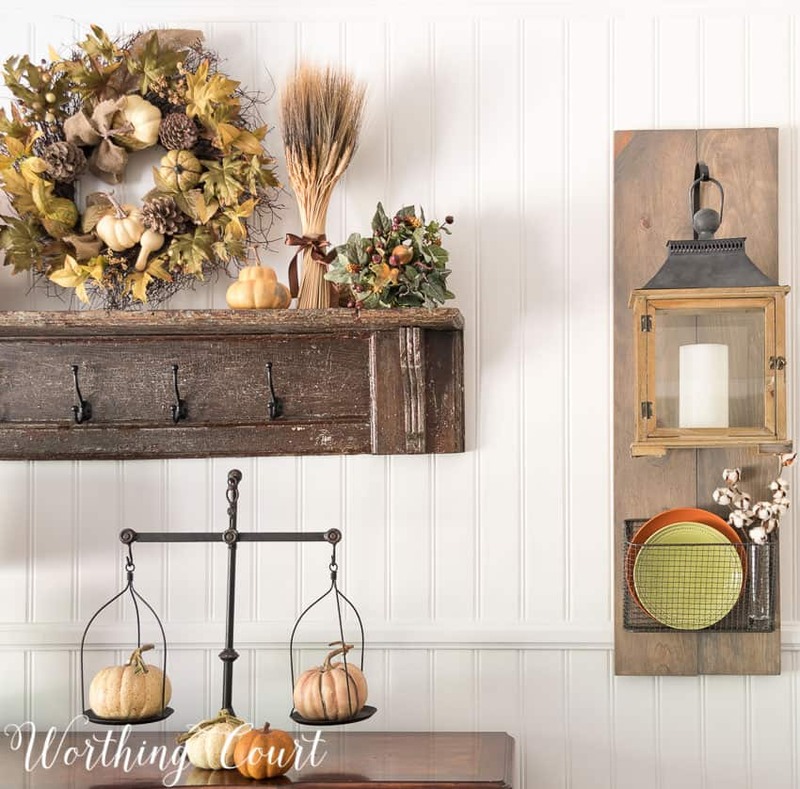 Love how you kept your existing decor and added some fall. I spy that pretty amber bottle. It looks great with all of the other fall colors. Well done, my friend! Everything is so beautiful, Suzy!! Love the weigh scales! And yes, I get so excited to decorate for different seasons! We are out of our home till end of Nov. because of water damage and I miss it so, so much! Suzy, ever y touch in the dining room is gorgeous. Love the plates hanging with a touch of fall, ingenuous. The dough bowl is filledith such goodies. Wow this is so beautiful! I don’t decorate for seasons very often, but I see several things you’ve done here that I can quickly and easily incorporate into my living room to make it just a little more festive. Thanks! Wow your home just looks so gorgeous and I love the neutral fall decor. So beyond beautiful Suzy! Your house is adorable! I love the styling. And that scale is fabulous! Love the grey and the muted fall accents. love the colors in the dining room You have some great ideas. I really enjoy your site and your ideas. It is refreshing to see the way you display your treasures. Love love love the fall decor. I have used several ideas at my home. Autumn is my favorite season and it is so fun to fill the house with it! 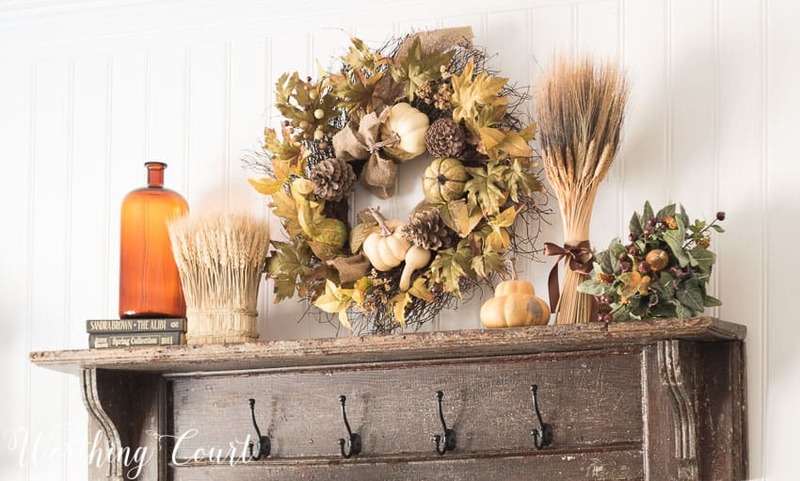 I so appreciate all the great ideas and especially the Fall decorating inspiration! I have that same wood lamp! Bought mine from PB. I can’t believe I have something that you do!!!!!? Mine is broken and sitting in a corner but all the more reason to take it in to get fixed now! Thanks. 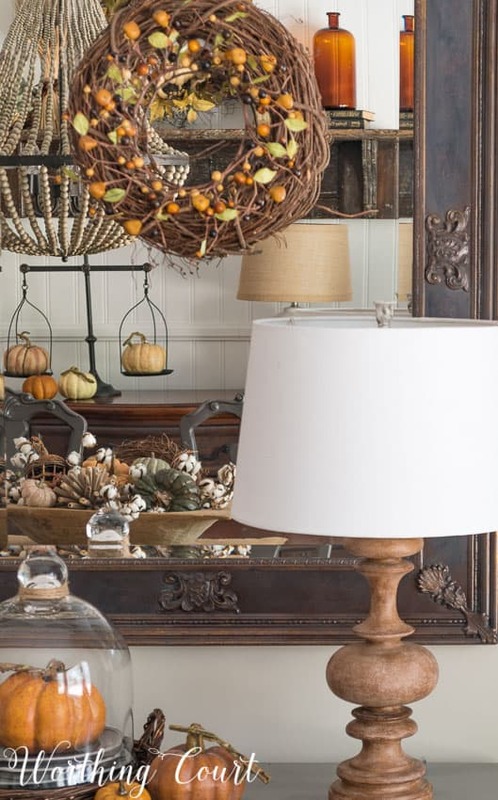 Love all your fall decor touches and how easily the season is integrated into your home. So pretty and so inspiring!! I love your fall decor, Now I need to get to work on mine! To say that I love to decorate is an understatement. It’s a passion that I live and breath every day. I joined the Worthing Court blog because I like the idea of sharing ideas and comments. 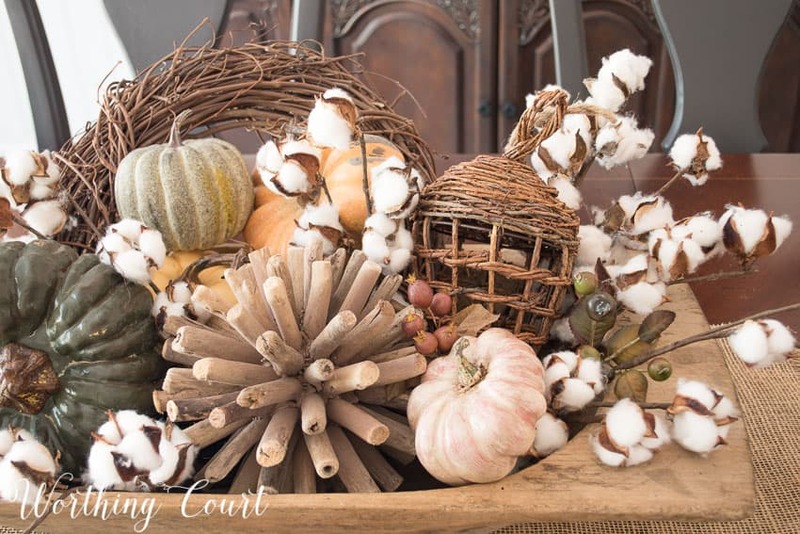 Although my home is French Country and this site appears to be primarily Southern Farmhouse style, I believe there is always an idea or perhaps a little hidden treasure you can find in a photo or a comment that you can incorporate into your own style. 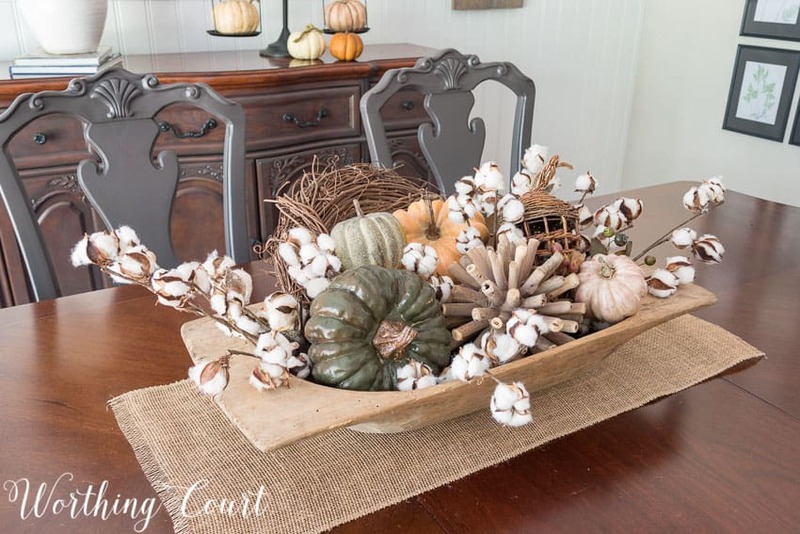 Here are a couple of comments on the Dining Room Makeover/Farmhouse Fall Accents. The dining table centerpiece is very nice. I like the idea of the lanterns but I would have mounted them without the boards to keep it visually lighter. If more length is needed for balance, I would use some type of long iron architectural piece for mounting. I also like the mirror with the shutters but without any accents. I think when you have a few great pieces to anchor a room you don’t need a lot of accessories. I’m a firm believer of less is more. Love it! Very warm and inviting! Love, love, love your dining room! Your decorating style is so simple, but effective. I have much to learn from you! Love your grapevine wreath! Any suggestions where can to buy one that is not flimsy like the ones sold at craft shops? Hi Hope. I’ve bought a few grapevine wreaths at Micheal’s, but I much prefer the ones at Hobby Lobby. They seem to be better quality and they always have a large selection of sizes. I am wondering about your table… I have been on a quest to find a farm style table that fits my space (72 x 36) and it is tough. Did you paint a table that was more formal to give it a farm style? Hi Heather. Yes, that’s exactly what I did! I painted the legs, but not the top because I figured it would get scratched up over time. If you’re interested, you can see what the furniture looked like before in this blog post: https://www.worthingcourtblog.com/dining-room-before-after/ . I love your mantle and how you change it for each season. I like your wreath in your dining room. I made one for my front porch , but it doesn’t look as good as yours. I went into Pottery Barn the other day and what a beautiful place! I am so happy to have found your blog. I am moving into a new home in a few weeks. Farmhouse decor is my style! I love the small shutters as sconces. That is a fistulous idea. I also the the coat-rack mantle. I will definitely be using some of your ideas in my new home. Oh my excuse my typo! It’ should have said fabulous idea! I LOVE the buffalo check fabric on the chairs!!!! You dining room is so warm and inviting! I’m so lucky to have found your blog. My husband and I have almost completed re-creation of the fixer upper hanging lanterns. However, we have not hung them on the wall yet. The lanterns are suspended from the hanger and I wondered if a support or stabilizing bracket is needed to prevent side to side movement? Hi Susan. If you’re referring to the wood piece that the lantern hangers are mounted on, side to side movement isn’t a problem. The wood pieces are hanging from the wall using a D ring hanger that I’ve added to the upper corner of each side, on the back. If you’re asking about whether or not the lanterns will move, mine hang perfectly still unless they’re bumped – then they swing just a bit. Mine are not hanging in a location where anyone can easily bump into them though. The only time that I’ve bumped them is when I’m doing something in that area – like dusting. 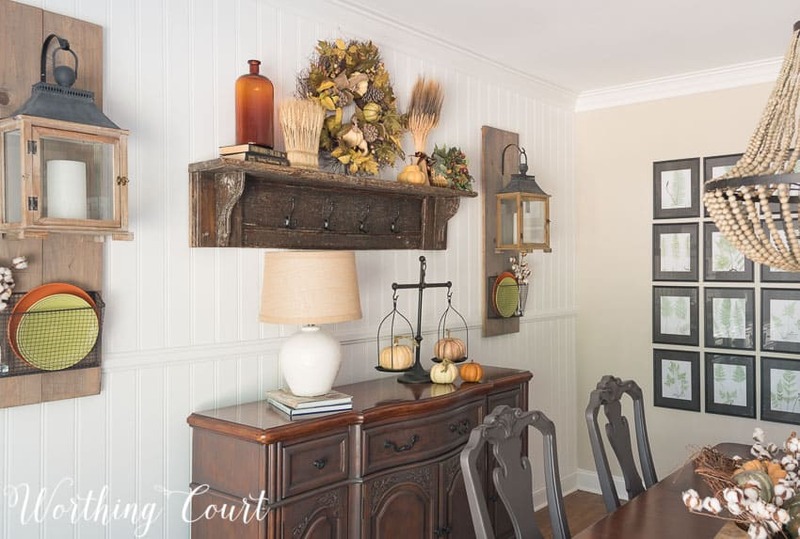 Love The mantle with the hooks and how you decorated it. Simplistic, elegant, pleasing to the eye. Love how you’ve arranged your dough bowl. Mine is so huge it takes too much to fill it. Maybe I need another one ? Really pretty. I love the indoor shutters and mirror design. I needed an idea to make a small living room feel larger. Thanks!